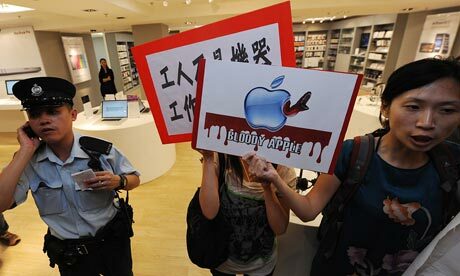 There's a lot of hand-waving around Apple's use of sweat shop labour in China. Apple CEO Tim Cook is offended and outraged by the mere suggestion that Apple engages in poor labour practices. And now they've sent the "Fair Labor Association" into Foxconn to perform an "audit" of labour practices at the company. In an SEC filing, Apple revealed that it awarded Cook with 1 million shares of Apple stock. At today’s closing price of $383.58, his new stock is worth $383 million. And what are they paid for the privilege of crappy work in sometimes dangerous conditions? According to an article in the Guardian they get as little as $8.16 PER DAY. Let's do some quick math, shall we? A Chinese Apple worker would have to toil for 47 million days (that's 128,787 years) to make as much money as Cook received in a BONUS last year. Or, put differently, all of Foxconn's 500,000 workers have to work for three months to make us much as Cook. So, I don't care if Apple builds Foxconn workers a new cafeteria or the Scab Fair Labor Association goes a little walkabout with company management to take iPhone pics of the smiling, happy workers that are lined up to prove how great their jobs are. In the context of the Chinese dictatorship, which penalizes any attempt to form independent unions, this can be nothing but a charade. And let's face it, Tim Cook is CEO precisely because he is the Apple executive most responsible for setting up Apple's lauded "supply chains" - i.e. Walmart style narrow profit margins for suppliers in third world countries, primarily China. They didn't make Tim Forstall, the guy who heads up Apple's iOS development - the software in Apple's most successful hardware line-ups, like the iPhone, iPad and iPod. They didn't make Jonathon Ives, the man behind Apple's signature design style, the CEO. No, they made the sweatshop master their big boss - because making profits is Apple's first priority. So, when Tim Cook says in one breath that he is offended by the suggestion that Apple profits from sweatshops - and in the other talks about how they are trying to decide what to do with their $98 billion cash horde - he is lying. That $98 billion doesn't belong to shareholders, whose prime quality that they have brought to Apple is the fact that they are giant investment funds and super wealthy investors. It belongs to the hundreds of thousands of workers who make the products from which Apple profits so heavily. But don't expect Apple to give any significant amount of that money to the workers - for one thing generosity of spirit is penalized by the stock market. If it goes anywhere, other than into making Apple even bigger, it will be to those wealthy shareholders who have already profited heavily - with Apple's stock having risen 20% in the last year alone. In other words, that $98 billion is stolen money - and in the context of worker suicides and life-shortening hard labour in Apple suppliers' factories, it is even worse than that. It is blood money. Greece: You Say You Want A Revolution? Psst...Torture's OK. Pass It On.